Four drivers will battle for one of the biggest prizes in junior motorsport when Rally Liepāja hosts the deciding round of the 2017 FIA ERC Junior Under 27 Championship from 6-8 October. As well as the honour of becoming an FIA champion, the winner will receive 100,000 euros to put towards an FIA ERC Junior Under 28 campaign in 2018 when they will step up to an R5 car. The amount provided by ERC promoter Eurosport Events will fund two ERC Junior Under 28 appearances next season in a Motorsport Italia-run ŠKODA Fabia R5 and incentivise the champion to secure the additional support for a full-season campaign totalling six events, although drivers count their best four scores only. Indeed, Marijan Griebel secured the inaugural ERC Junior U28 title this year with a four-event programme of rallies. 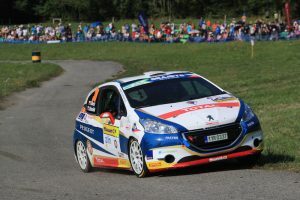 With five rounds run in ERC Junior Under 27 in 2017, Filip Mareš – who competes with the full backing of the Czech motorsport federation in a Peugeot 208 R2 – heads the standings a mere two points in front of Opel Rallye Junior Team driver Chris Ingram from the UK. Hyundai Motorsport’s new world championship recruit, Jari Huttunen from Finland, and fellow Opel ADAM R2 driver Aleks Zawada from Poland are firmly in contention, 11 and 18 points behind Mareš respectively. Buǧra Banaz (Turkey), Dominik Brož (Czech Republic), Alex Forsström (Finland), Kristöf Klausz (Hungary), Karel Kupec (Czech Republic), Tamara Molinaro (Italy) and Mārtiņš Sesks (Latvia) complete the ERC Junior Under 27 entry on Rally Liepāja. Stéphane Lefebvre, Emil Bergkvist and Marijan Griebel have all won the ERC Junior title in the past.